Thanks to technology and public-awareness campaigns (don’t text and drive! ), driving has become safer over the past few years. So why have auto insurance rates generally been trending upward? You would think that having safer vehicles, with all the safety bells and whistles, would decrease insurance costs, right? Think again. Despite increased safety measures, auto insurance rates for many have continued to rise. Perhaps your auto insurance rates have remained stable. But if they have been sliding upward, here are some possible reasons. One reason for increased insurance costs is that the costs associated with auto accidents have gone way up. From 2015 to 2017 alone, accident costs of all types have increased dramatically. See the infographic below for a breakdown of these costs by each type of insurance coverage, according to the ISO Fast Track Monitoring System*: The cost of bodily injury has gone up by 14 percent; property damage, 14 percent; personal injury protection, 13 percent; collision, 11 percent; and comprehensive coverage, a whopping 25 percent. Another reason for increased insurance costs is that people are making more auto insurance claims than ever. The frequency of claims for car collisions has been rising since 2010. Several factors would explain this, according to the Insurance Information Institute. Take a look at the infographic below, on road safety. 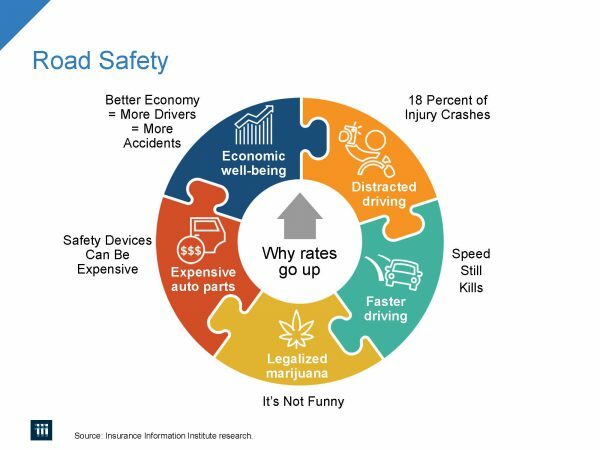 * It presents an interesting picture of how the improving economy; speeding; more expensive auto parts—including high-tech safety devices; distracted driving; and driving under the influence of legalized marijuana all contribute to the picture. As the country’s economic recovery from the Great Recession continues, people are driving more than ever. So it only stands to reason: the more people drive, the more car accidents happen. Then there is the perennial problem of speeding. The National Highway Traffic Safety Administration reports that speeding has continued to contribute significantly to increasing numbers of deadly vehicle crashes since 2014. In addition, as the economy has improved, people have been spending more money on higher end vehicles. Consider how much technology is in a car nowadays. Computers monitor everything. We now have digital lane-keeping (or “lane-departure”) alert systems that beep when we begin to drift out of our driving lanes. We have automatic parallel-parking features in our cars, equipped with backup cameras, and proximity alarms that go off when we get too close to a vehicle or object behind us. Regarding safety, some argue that although this enhanced technology has been demonstrated to prevent auto accidents and mishaps, perhaps people are not paying as much attention behind the wheel as they should be. Perhaps they are relying too much on the technology, potentially leading to crashes caused by inattention or distraction. Guess what happens when you crash an expensive vehicle? It costs a lot of money to repair, generating higher insurance claims. Say hello to higher insurance rates. Here is an example: According to Liberty Mutual data gathered by the Insurance Information Institute,* the total cost (parts and labor) of fixing a bumper on an entry-level luxury car (with a sticker price of approximately $35,000) went up from an average of about $1,850 to $3,550 from 2014 to 2016. That’s a difference of $1,700. It turns out that having a distance sensor and a more complicated headlamp assembly, along with the cost of the resulting mechanical labor on your luxury car’s bumper, all add up to a pretty penny to fix. The jury is still out on the exact impact of distracted driving on insurance rates. Fewer people are talking on their cell phones while driving, but more people are texting and surfing the Internet today than a few years ago, according to the National Highway Traffic Safety Administration. But still, 18 percent of crashes that result in personal injuries are caused by distracted driving, according to the Insurance Information Institute. Add to that statistics from the Highway Loss Data Institute* about the rising rates of collisions (from 2012 to 2016) in states with legalized recreational marijuana use, including Colorado (crashes up by 14 percent), Washington (up by 6.2 percent), and Oregon (up 4.5 percent). You can draw your own conclusions as to effects that distraction and dulled senses can have on crashes and how this might impact insurance rates. As you can see from the mounting evidence presented above, despite public-safety campaigns and cutting-edge safety advances in auto design, car insurance rates have been trending higher over the past several years. Growing costs of accidents and increasing numbers of auto claims across the nation appear to be the main culprits, due to a wide range of factors—some economic, some behavioral, and some technological. There’s no clear-cut, no-brainer cost-cutting method to reduce your auto insurance rates. And it may be that your own auto policy has not been impacted much by the above factors. Perhaps the best advice is to focus on driving as safely as you can—not only to protect your own personal safety and the safety of your passengers (top priority, of course! ), but also to keep your auto claims and expenses down. 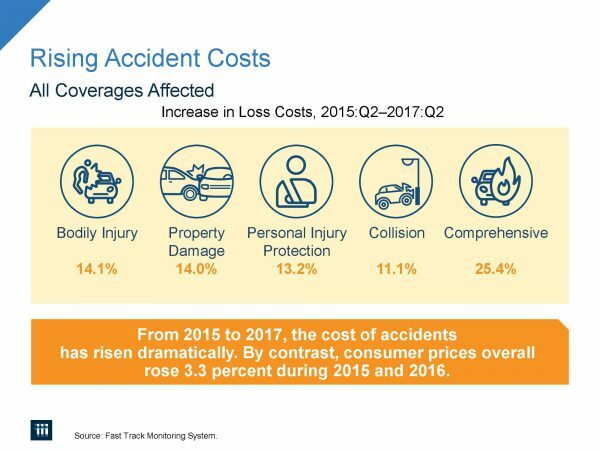 *Infographics and information from “Rising Auto Costs,” presented by James Lynch, FCAS MAAA, of the Insurance Information Institute, at the Casualty Actuarial Society Annual Meeting held November 7, 2017, in Anaheim, Calif.